Decades later, can a Navy fighter pilot finally find his father’s downed plane? Jeff Cathey knew he needed to stand on the spot where his Army pilot father died. He needed to face the family history head-on. Captain Eual Cathey (left), an L-20 Beaver aircraft, and the site where Cathey’s plane crashed in Vermont. 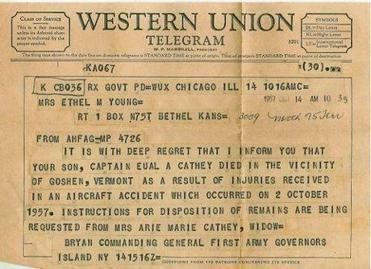 Eual Cathey was killed in 1957 while flying three Army officers to an inspection at Norwich University. 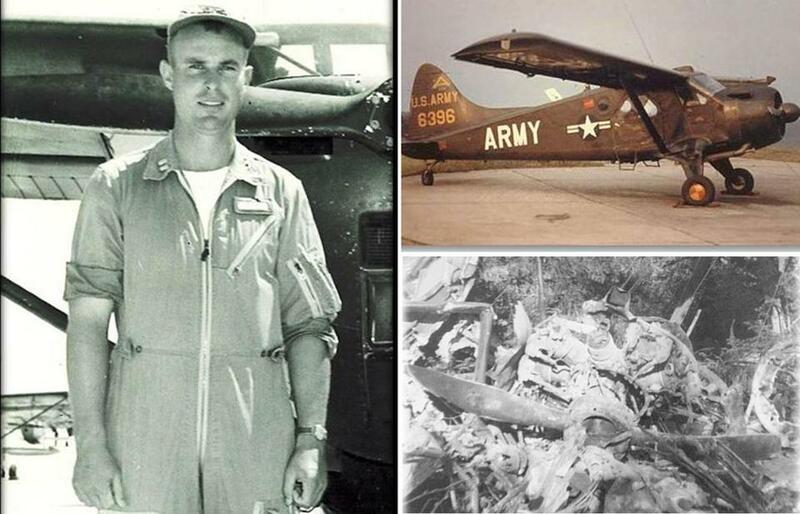 ON OCTOBER 2, 1957, an L-20 Beaver US Army light utility aircraft crashed near the Brandon Gap in central Vermont. The thick forests of the Green Mountains were laden with early snow, and it took more than a week to find the wreckage. The pilot was Eual Cathey, a stocky brush-cut 33-year-old captain with four sons and a pregnant wife at home at Fort Hamilton, in Brooklyn. Eual was flying three other officers to an inspection at Norwich University, the military academy near Burlington. Twenty minutes from landing, Eual radioed the tower to say they were on time and all was well. But then an unexpected storm blew in, and a strong west wind pushed them off course. The ridgelines below were obscured, and as the plane descended through the cloud layers, it dipped too low. The fixed wheel struts clipped the treetops, flipped the plane, tore off the tail, and drove the aircraft into the ground. All four men on board died. In 1957, Jeff Cathey was only 3 years old, too young to fathom the loss of his father, but his oldest brother, Joe, was 10, and heartbroken. After the funeral, several military officers visited their apartment and told Joe that he was now “the man of the house.” He needed to shoulder all the responsibilities that implied. Seeking sunshine and a fresh start, Jeff’s mother eventually moved with her children to Florida’s Tampa Bay. Growing up, Jeff saw family photos of his smiling dad carrying armloads of sons around the front yard. He heard occasional stories — that his father liked to fly, that he was proud of his military service — but was told little more than that his father’s plane went down in bad weather. Jeff joined the Navy in 1979 and immediately went to fighter-pilot training. “I will not say it’s fate, because I don’t much ascribe to that,” he says. He set out to be the best instrument pilot around, adept at the “varsity level stuff.” He took off from aircraft carrier decks at night — through fog banks, in rain and shearing winds — and landed his single-seat jet on the steel runways pitching about in lurching seas. Jeff’s mother died in 1987, but he had found a letter she’d written, describing a trip to Vermont to search for the site of her husband’s crash a year after he went down. She never found it. Jeff wanted to do better. From his post in the Pentagon, he reached out to some sources and obtained an unredacted copy of the 1957 US Army Aviation safety report. As a pilot and Navy captain, he had read thousands of such reports, and initially he approached the facts of the case with the distance of a professional inquiry. The report offered something else, however: a specific crash location. The site was at a particular latitude/longitude coordinate, accurate to 1 square mile, “100 feet below the crest of Bloodroot Mountain at an elevation of approximately 3,400 feet.” Jeff knew he needed to stand on the spot where his father died. He needed to see and feel the place, face the family history head-on. The crash had been a big story in Vermont at the time, so Jeff e-mailed local newspapers to gather any available ground truth from old-timers with long memories. And that is how he found Bill Powers. 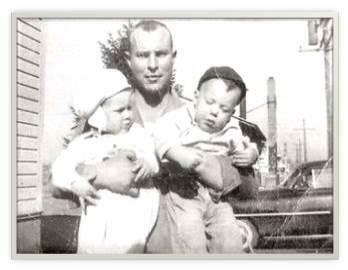 Eual Cathey holds his sons, Jeff (right) and Dan. BILL POWERS WAS ONLY 12 YEARS OLD in 1957 when his father took him to the crash site to help recover the bodies. Bill wasn’t scared, he was excited. His dad, normally so busy as the medical examiner for Rutland County, was taking him for a hike. On Saturday, October 12, father and son hiked the main trail toward Bloodroot Gap for an hour or two before turning west, following a wide new route through underbrush crushed by tracked vehicles from the State Police. The crash site wasn’t hard to find. The pieces of the plane were remarkably consolidated; the aluminum tail section hung from a tree, but the main fuselage and engine were fused together in one pile of twisted metal. The aircraft had nosed in and caught fire, trapping three men — Cathey, Colonel Emery Hyde, and Lieutenant Colonel Clinton Merrill — underneath the burning wreckage. They found the fourth passenger a short distance downhill. Colonel David Perkins was still in his dress uniform, in shirt and tie and shiny shoes. He had a handkerchief wrapped around his head, to stanch the flow of blood from a missing ear. He died of exposure, Bill’s father said. Maybe internal injuries as well. Lying next to the colonel was a single sheet of paper and a cigarette lighter, the only sign he had tried to make a fire. Based upon the growth of his beard, investigators would later determine it took Perkins three days to die. Ten years later, Bill Powers joined the Air Force as a logistics officer. He saw the world, retired in 1988, and then worked as an Air Force contractor near Boston. But he always stayed up on news from home, and it was no surprise that an old childhood friend would call him in the spring of 2005 — Bill was now 60 and nearing his second retirement — to ask if he had seen that morning’s Rutland Herald. Powers pulled the public service announcement up on his computer: A man named Jeff Cathey was looking for anyone who had any information on the 1957 plane crash that killed his father. Powers contacted Jeff at the Pentagon and told him what he knew. Members of the Pidgeon family, who owned the local scrap yard, collected valuable aluminum from the wreck a couple of weeks after the crash. IN AUGUST 2005, Jeff and six members of his family — his son Tyler and nephew Ian, plus four of his siblings, including older brother Joe — traveled to Vermont. They were armed with a GPS, coordinates from the safety report, and the collected memories of Rutland County. Jeff had received other calls and had been in touch with members of the Green Mountain Boys, the storied Vermont fighter wing of the Air National Guard, who recommended Jeff speak to local plane crash expert Brian Lindner. Bill Powers met the group in a parking lot near the Brandon Gap, handed Jeff a topographical map, and wished him luck. “With seven searchers in a small area, we were pretty hopeful we’d come up with something,” Jeff says. Within a few hours, though, the enormity of the problem was revealed. Suddenly, from their place on Bloodroot Mountain, the old crash report looked analog and inconsistent, full of imprecisions that sometimes contradicted basic geography. And in full summer, the underbrush was lush and impenetrable, the ground completely obscured within 10 or 20 feet. All day long, they fanned out across hillsides, checked their bearings, shot lines of dead reckoning based on vague witness descriptions. Eventually they realized they weren’t going to find the crash. They gathered for a small, somber ceremony, and each family member put a memento of Eual in a jar. A pair of wings, a photo, an ID card. They buried the jar on the mountainside and went back to town. The next day, a humbled Jeff followed up on his other leads, and Lindner introduced the Catheys to several elderly men who still lived near the mountain. Each remembered the crash in his own tangential way but said that even if he still had the stamina to hike in the backcountry, he wasn’t sure he could find it again. Jeff returned home empty-handed. Powers promised to keep looking, and so did Brian Lindner. Tyler Cathey, Allen Pidgeon, Jeff Cathey, Bill Powers, Dallas Cathey, and Brian Lindner. BRIAN LINDNER IS THE SELF-APPOINTED plane crash guru for Vermont. As a boy, he spotted pieces of a B-24 bomber on Camel’s Hump mountain while on a hike with a friend. Back home, he asked about it, but his father didn’t know the history, so the boy researched it himself. Now Lindner collects and catalogs crashes — more than 130 military planes, at last count, and several times that for civilian aircraft. He found approximately 35 of the wrecks himself. While he had sporadically looked for Eual Cathey’s L-20 over the years, he started searching in earnest after he met Jeff. For Lindner, the problem was one of paperwork. While the Army Aviation report claimed the wreck was just off the summit of Bloodroot Mountain, other contemporary accounts disagreed. 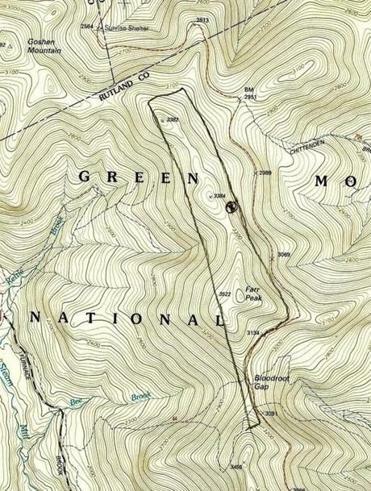 Depending on the author, the plane crashed at Bloodroot Gap, Blood Route Mountain, Lookout Mountain, Farr Peak, or somewhere off the Brandon Gap. “The Army puts it on this mountain,” Lindner says with frustration, pointing at one place in the air. “But the State Police put it on this mountain, the Burlington Free Press here, the Rutland Herald here, and on and on,” he says, sketching the whole range with his hands, until his arms are completely outstretched. The potential search area had ended up being dozens of square miles. While Jeff was back at the Pentagon, teams of locals continued the search effort. As a crash cataloger, Lindner felt motivated by the opportunity to bring closure to families. Bill Powers felt a fatherly kinship with Jeff, plus the nag of an unsolved puzzle. In the fall of 2005, and all summer the next year, Lindner and Powers walked each peak, using the aircraft’s heading and last known radio call as reference. In order to meet a self-imposed 50th-anniversary deadline, there was a surge of activity in 2007, but it came to nothing. One day, the community center teacher announced that the class would learn dowsing with maps. Well, have I got a map problem for you, Powers thought. He brought in his topographical charts for the central Green Mountains and asked if anyone wanted to take a look. Clarence Decker, an old-timer well known for his ability to dowse, volunteered. Powers told the class the story of the L-20 and the search by the Cathey family and handed Decker a map with the most likely crash area roughly outlined, an oblong puzzle piece more than a mile long. Decker nodded but said little and sat by himself for a long time. The minutes passed. Powers didn’t disturb him. Eventually, Decker got up and returned the map. “There’s the crash,” Decker said simply. The trail map that dowser Clarence Decker marked. Just west of the Long Trail, in a cluster of tightly packed elevation-contour lines facing the morning sun, Decker had drawn an asterisk in black pen. Powers and Lindner returned to the mountain with some volunteers, state troopers, and a search and rescue team. Lindner was skeptical; he needed to be persuaded to walk the slope. He and his volunteers had already been over that stretch of land several times. On this pass, though, Lindner saw something new. An array of rusting engine cylinders, big as coffee cans, poking out of the brush. He and a state trooper shouted “Found it!” at the same moment. It was May 9, 2009, nearly four years since they’d started actively searching. Of all the possible options off the reports — Bloodroot, Blood Route, Lookout, Brandon — the crash was discovered on an unnamed mountain, part of a ridge that forms the northern arm of 3,517-foot Farr Peak. Several weeks later, in a hasty family reunion, the Catheys returned to Vermont, discovering that in 2005 they had passed within 100 yards of the crash. It was there in one little pile: struts, control bar, crankcase, tubing for brake lines, the cast-iron firewall that separated the engine from the passenger compartment. The moment was bittersweet. Jeff’s brother Joe, the once young man of the house at age 10, walked alone to the crest of the hill. Jeff took a photo of the coordinates on his GPS, so he would never again have to search for his father. Jeff Cathey with the newly excavated strut from the plane crash site. JEFF STILL MAKES occasional pilgrimages to the crash site with his family, and in 2015 I accompanied him and his sons on their latest trip. In 2009, Jeff had recovered and carried out the plane’s starboard strut, which had foot pegs welded to it for boarding the aircraft. This time, he wanted the port strut, with the corresponding stairs, so whichever side Eual used, Jeff would be sure to have reclaimed his father’s last steps. Jeff’s oldest son, Dallas, had never before made the trip to the crash site. He bore the most striking resemblance to his grandfather: round face, shy smile, often quiet as a photograph. Jeff, then 61, still looked like the image of a Hollywood fighter jock. Square jaw, barrel chest, Southern drawl. And Tyler was half a head taller than his dad. He played on the defensive line at Muhlenberg College in Pennsylvania and is chief operating officer and general counsel to a large Florida real estate firm. Tyler goes by his middle name, but his first name is Eual. On this trip, we were joined by Bill Powers, Brian Lindner, and Allen Pidgeon, who had been to the crash site once before. On October 13, 1957, one day after Powers and his father removed the bodies, the Pidgeons — Allen, his twin brother, Arlen, and their father, among others — made the trip themselves to recover valuable scrap metal for their junkyard. Allen, then 12 years old, was just happy to spend time with his dad. Our group climbed for an hour, an easy packed-dirt path through the airy forest. It had been a warm, dry summer, and the trees had a faint yellow about the edges. When we got to a campground sign, a landmark on Lindner’s map, he started counting his paces. Somewhere around a thousand, we made a hard right turn into the woods. “My fifth time,” Powers said, “and every time, a question of whether I can find it.” We bushwhacked along a small rocky creek, crossed a swampy marsh, and then moved sharply uphill again. Tyler had gone ahead, Jeff and Dallas lagged behind with their GPS, and Pidgeon started looking for moose antlers. I pressed on alone up the hill and stumbled upon what could only be a block of cylinders from an aircraft engine. Rusted to the same color as the dirt, only the man-made perfect circles caught my eye. 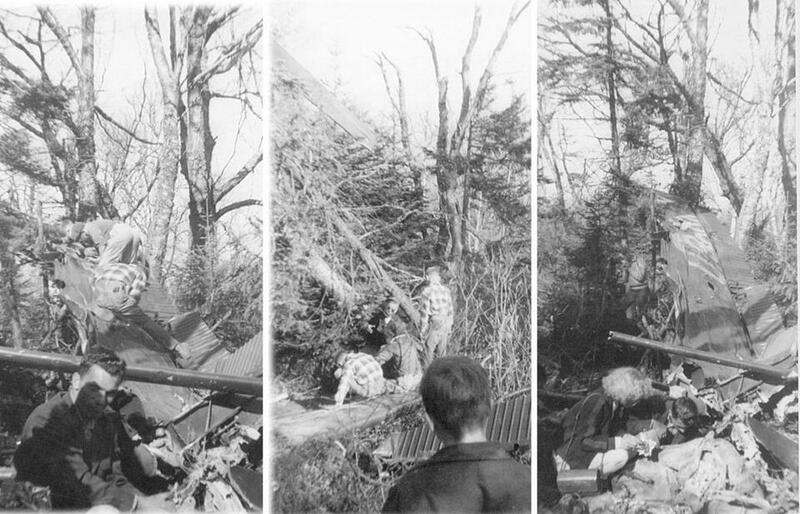 Above me Lindner called “Got it,” and soon the family converged around the decayed wreckage. It was tossed in a disorganized heap, but the slag melted by the violent fire was still visible. For the Catheys, the ground is more familiar than sacred — all that mourning was wrung out in 2005. Powers told stories of the search and recovery. Lindner pulled out his metal detector to look for scraps. Dallas sat to one side and took it all in. We tarried awhile, longer than necessary. For lunch, the Catheys had brought a loaf of bread and several pounds of lunch meat, and Jeff and Tyler ate like the college football players they once were. “Around Tyler, you have to learn to eat preemptively,” Dallas said. When it was time to descend, we split the load. Dallas took a control arm that would have connected the foot pedals to the rudder. Tyler hefted the strut across his shoulders as a yoke and refused help with the load, carrying it several miles to the trailhead. At the FedEx shipping office, it weighed in at 116 pounds. Back at the parking area, the Catheys loaded the strut into the back of their rental sedan and our little party broke up. Jeff and his sons were looking for a restaurant where they could eat a steak and toast Eual over a Long Trail beer. The few pieces of the plane that remained on the mountainside were heavy or quite deteriorated. Would Jeff want to come back? Brian Castner is an Iraq War veteran and author of “The Long Walk.” Send comments to magazine@globe.com. Follow us on Twitter @BostonGlobeMag.